« Les Oliviers ». 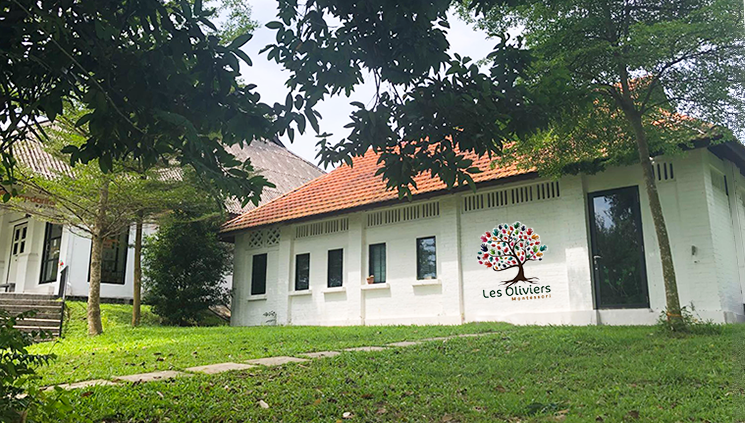 First and unique bilingual French/English Montessori learning centre in Singapore. We welcome children aged 15 months to 6 years old in our centre situated in Dempsey. The families coming to Les Oliviers are from different nationalities and this diversity creates a rich, stimulating and tolerant environment. Committed to respect the essence of the Montessori pedagogy, we have a team of motivated and experienced teachers lead by an educator certified by Association Montessori Internationale (AMI). AMI was created by Maria Montessori herself to preserve and promote the principles and practices of her pedagogy. Montessori philosophy is a child-centered approach in education, which believes that a child learns best in an environment that supports and respects each individual’s unique development. What to expect in a Montessori classroom? Material focusing on five areas: practical life, sensorial, language, mathematics and culture. Maria Montessori (1870 – 1952) was the first practising woman doctor in Italy. As a physician, Dr. Montessori was in touch with young children and became profoundly interested in their development. Through careful and exhaustive scrutiny, she realised that children construct their own personalities as they interact with their environment. She also observed the manner in which they learned as they spontaneously chose and worked with the auto didactic materials she provided. Her approach to education stemmed from a solid grounding in biology, psychiatry and anthropology . She studied children of all races and cultures in many countries around the world, soon seeing the universality of the laws of human development played out before her.